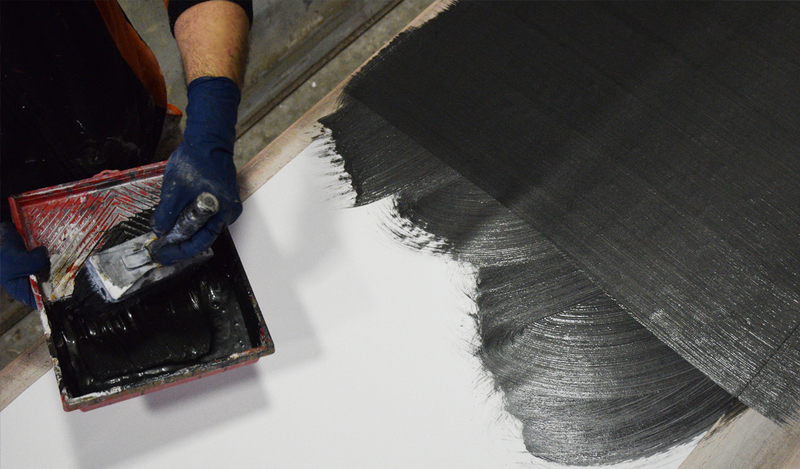 Our factory creates, produces and distributes luxurious decorative panels, mural coverings and objects of furnishings. HISTORY and CONTEMPORANEITY, centuries of Italian decorative tradition, melted with the most contemporary and elegant design, with the modern standards of quality and reproducibility, they are at the base of our project of our actual production. The COLLECTIONS are completely handmade and painted, developed and created in our Italian workshop. We use precious MATERIALS: non-woven fabric and, in some cases, pure cellulose paper resistant to embossing. We use pigment pastes, in powder an natural clays such as ochre, scorched earth and English red. The resins that bind the pigment to the frame are artificial or natural such as linseed oil, casein, natural rubber and beeswax. The PRODUCTION is 100% made in Italy and in our workshop, the non-woven fabric panels are laid out on tables 7 meters long and hand made by paint brushes, sponges and brushes in order to reach the required decoration. The USE is for INTERIOR DESIGN by architects and interior designers, to cover walls and home furnishing in classic and contemporary ambience and to create new spaces, new scenes of daily life. "The Manufacture of the paper”. In those years, besides us, in northern Italy between Milan and Turin, were operating about ten companies that produced wallpapers handmade. In our workshop we worked alongside leading designers and editors of the national and international wall covering industry. More than thirty years later, in 2008 (spent that 'exciting period’) our renovated company, managed by the second generation, comes with its own brand "LA SCALA MILANO". We work in the interior design with diversified products: wall covering, decorative panels and furnishings, strictly hand-made in Italy in our workshop. Today, our products are widespread , nation to nation, from the most important distributors, operating in the field of luxury supply for interior architecture. Dear Friends and Partners,wa are all set for the January Fair! And we are super excited to present you our New Collection for the 2019 at Maison & Objet in Paris, introducing new textures and colours to amaze you.